In 1777, as General John Burgoyne’s army marched south, having taken Fort Ticonderoga, a temporary loyalist enclave was created in Rutland County, Vermont. While many rebel Americans fled before the British Army, a few stayed on. In Rutland Nathan Tuttle, a rebel known locally for hating and taunting loyalists, was one of them. Tuttle’s decision to stay behind was not a very good one at a time and place when the American Revolution was a full-scale Civil War. As Burgoyne’s army passed through Rutland, Tuttle disappeared. Ten years later it was revealed by a local Tory that Tuttle had been bayoneted, his body weighted with stones and thrown into a creek. Nathan Tuttle was an American, and so were his murderers, likely men associated with the notorious Loyalist and close confidant of John Burgoyne, Philip Skene of Whitehall. Under the grand story of the fight for American independence are finer threads, stories of people who are often assigned a mere footnote in the Revolutionary narrative. Offering a fresh look at the lives of those who sided with Britain during the American Revolution, TORIES: Fighting for the King in America’s First Civil War, by Thomas Allen, weaves a provocative and unsettling picture of a bloody and savage civil war that divided America and sent more than 80,000 Tory Americans — Loyalists, as they called themselves — fleeing to Canada, the United Kingdom and other parts of the world. For Loyalists, America was home; yet, when they sought to preserve allegiance to the Crown and protect their homes from the rebels, many Loyalists found themselves in a civil war raging in the midst of a Revolution. Hatred between Tories and Patriots divided families, friends, and communities. This war was vicious and personal, forcing many Loyalists to flee America. Those who chose to stay quickly realized that if they had any chance of survival, the British had to win. Incorporating firsthand documents from archives in the United Kingdom and Canada, TORIES gives voice to little heard and Americans. 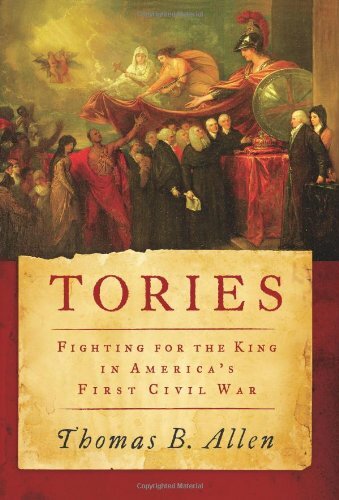 TORIES also explores little known facts about Loyalists, such as: New York City and Philadelphia were Tory strongholds throughout the Revolution; at times, Georgia and the Carolinas had more trained and armed Tories than British Redcoats; Lord Dunmore, a Virginia royal governor, offered freedom to any slave that joined the British fight, creating thousands of black Loyalists; Scottish Highlanders, though onetime foes of the British, fought for the Crown in exchange for land grants; and William Franklin, son of Benjamin Franklin, led a brutal Tory guerrilla force that terrorized New Jersey. While historical accounts portray the Revolution as a conflict between the Patriots and the British, there is another narrative: the bloody fighting between Americans, a civil war whose savagery shocked even battle-hardened Redcoats and Hessians. From mudslinging and rhetorical sparring to water-boarding, house-burning, and lynching, here is the rarely chronicled war-within-the-war that adds a new dimension to the history of the American Revolution. TORIES introduces readers to the forgotten Americans who chose the British side—and paid dearly for their choice. THOMAS B. ALLEN is the author of numerous history books, including George Washington, Spymaster and Remember Valley Forge. A contributor to Smithsonian Magazine, National Geographic, Military History Quarterly, Military History Magazine, Naval History, Naval Institute Proceedings, and other publications, he lives in Bethesda Maryland with his wife, artist Scottie Allen. My great-great grandma was Sarah Carr who died in New Brunswick, Canada. The family probably returned from NY to Canada before she was born. My direct ancestor was her third husband, Thomas Gilson.